wonder_city | Entries tagged with extra! Madame Destiny's theme today is clocks: tiny clockfaces adorn her dangling gold earrings, there is a half-dollar-sized gold watch resting just below the crisp collar of her buttoned white shirtwaist on a gold ribbon, and her left wrist sports a loose gold watch-bracelet. Across her neatly-tailored brown waistcoast drapes a magnificent triple-stranded heavy gold Prince Albert watch chain from one brass button to the watch pocket, and the fob of the watch chain is also a tiny watch. An enormous ring shaped like a grandmother clock lines her left middle finger like armor. The folds of her voluminous brown skirts periodically display a large golden watch hung like a nun's rosary from Madame's wide leather belt. Close examination reveals that the fine pattern on her waistcoat is, again, tiny clockfaces. This is only topped, so to speak, by the fine, tall, black silk tophat whose band is adorned all round with clockfaces. Madame Destiny ticks from all sides and angles. They are all set to different times, and the resultant hum of unsynchronized ticking is suprisingly soothing. She gently cracks her knuckles, one at a time, and smiles across the table. "A full reading today, yes, dear? It's been a while since I last saw you. Let's see what the Universe has been thinking about you lately." Today, Madame Destiny is sporting a wrap that appears to be made of brown and white speckled feathers and a close-fitting cap of same, over an ankle-length black dress with sweeping wrap-like folds across her body, leaving a generous amount of admirable bosom exposed. That bosom is adorned with a large Bohemian-garnet-and-seed-pearl pendant on a doubled gold lorgnette chain. Her earrings match the pendant, as do the bangle bracelets on each wrist. "You want one of my Perisphere-and-Trylon readings?" she says, picking up her deck and shuffling it expertly. "Well, let's have a look at what the Universe has to tell you." The last batch of single-card draws! Soon to come: a 5-card reading and a 10-card reading. Thanks so much for everyone who asked for a card! The third batch of single-card draws! The second batch of single-card draws! The first batch of single-card draws! Madame Destiny Reads Your Cards! Madame Destiny sees all! Knows all! And might tell you some of it! Until midnight tonight (Wonder City time [Eastern time]), she will entertain requests for Tarot readings. For free, gratis, nada, she will draw one card from her World War II Wonder City Wonders Tarot deck and tell you what is most dominant in your life right now! Simple comment below and request a card. For a mere $20, she will perform one of her renowned 5-card Perisphere-and-Trylon readings! For the simple investment of $50, she will give you the benefit of all her considerable skills and perform a full (10-card) reading! It's been a while since I did one of these. Today, in hopeful celebration of spring coming soon after the arrival of March, I'm offering Tarot readings, written in the persona of Madame Destiny. Also, really, can you resist seeing what she'll wear *next* time? Wooo, I finally got it written and up! Hope you enjoy this reading! My apologies for the slowness of getting this up, and also because there will be no new episode today. Apparently, my brain went off on summer vacation and didn't take me. I will try to get the new ep up by Friday. Remember that the offer of readings from Madame is good only until midnight tonight, until the next time I decide to do this! - $5 for a one-card draw. - $15 for either a 3-card answer to a specific question or a 5-card general reading. - $45 for a full 10-card reading. For five thin dollars, she will draw one card from her World War II Wonder City Wonders Tarot deck and tell you what is most dominant in your life right now! For a mere fifteen dollars, she will either answer a question (3-card reading) or give you an abbreviated general reading (5-card Perisphere-and-Trylon reading)! For the simple investment of forty-five dollars, she will give you the benefit of all her considerable skills and perform a full (10-card) reading! This offer will be open until Monday, June 18, 2012! My freelancing is a little thin on the ground right now, so I thought I'd offer another set of Madame Destiny readings. 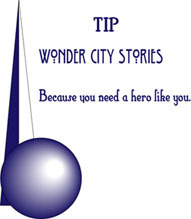 Think of it as buying Madame some tea while learning some Wonder City backstory! Remember, all these readings are done *in character* as Madame. I am a very slow child, and I am sorry. I will probably continue slow, since I am afflicted with plague right now. Here is the second of Madame's commissioned full readings. Enjoy!